Attacking the commentary of Christopher Booker, not the primary source of the allegations. Referring readers instead to a dogmatic source who claims that only 3 stations are affected, something clearly contradicted by Booker and the primary source. Alleging that the complaints are solely about cooling the past, uses a single counter example for Svarlbard of a GISS adjustment excessively warming the past compared to the author’s own adjustments. However, compared to the raw data, the author’s adjustments, based on local knowledge were smaller than GISS, showing the GISS adjustments to be unjustified. But the adjustments bring the massive warming trend into line with (the still large) Reykjavik trend. Examination of the site reveals that the Stevenson screen at Svarlbard airport is right beside the tarmac of the runway, with the heat from planes and the heat from snow-clearing likely affecting measurements. With increasing use of the airport over the last twenty years, it is likely the raw data trend should be reduced, but at an increasing adjustment trend, not decreasing. Further, data from a nearby temperature station at Isfjord Radio reveals that the early twentieth century warming on Spitzbergen may have been more rapid and of greater magnitude. GISS Adjustments reduce that trend by up to 4 degrees, compared with just 1.7 degrees for the late twentieth century warming. Questions arise how raw data for Isfjord Radio could be available for 22 years before the station was established, and how the weather station managed to keep on recording “raw data” between the weather station being destroyed and abandoned in 1941 and being re-opened in 1946. In climate I am used to mis-directions and turning, but in this post I may have found the largest temperature adjustments to date. In early February, RealClimate – the blog of the climate science consensus – had an article attacking Christopher Booker in the Telegraph. It had strong similarities the methods used by anonymous blogger ….andthentheresphysics. In a previous post I provided a diagram to illustrate ATTP’s methods. Attacking the secondary commentary, and not mentioning the primary sources. Misleading statements that understate the extent of the problem. Avoiding comparison of the raw and adjusted data. Single counter examples that do not stand up. Like ATTP, RealClimate attacked the same secondary source – Christopher Booker – but another article. True academics would have referred Paul Homewood, the source of the allegations. Homewood has now turned his attention to the weather stations across much of the Arctic, between Canada (51 degrees W) and the heart of Siberia (87 degrees E). Again, in nearly every case, the same one-way adjustments have been made, to show warming up to 1 degree C or more higher than was indicated by the data that was actually recorded. My diagram above was published on the 8th February, and counted 29 stations. Paul Homewood’s original article on the Arctic of 4th February lists 19 adjusted sites. If RealClimate had actually read the cited article, they would have known that quotation was false in connection to the Arctic. Any undergraduate who made this mistake in an essay would be failed. 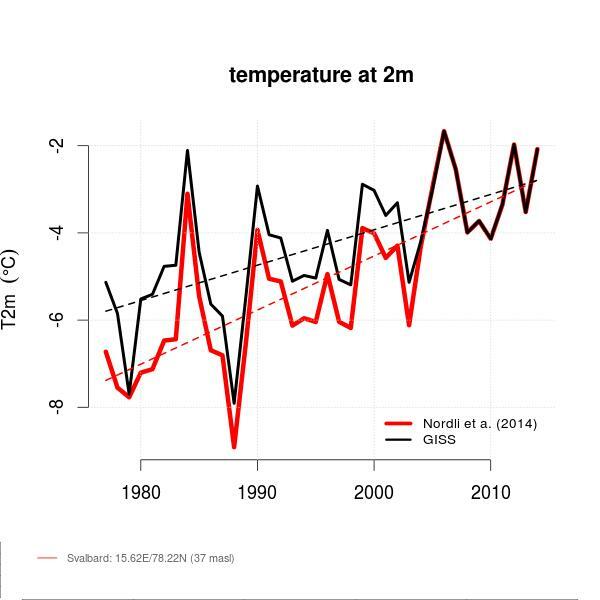 Øyvind Nordli – the Real Climate author – provides a counter example from his own research. He compares his adjustments of the Svalbard, (which he did as part of temperature reconstruction for Spitzbergen last year) with those of NASA GISS. Clearly, he is right in pointing out that his adjustments created a lower warming trend than those of GISS. I checked the “raw data” with the “GISS Homogenised” for Svalbard and compare with the Reykjavik data I looked at last week, as the raw data is not part of the comparison. To make them comparable, I created anomalies based on the raw data average of 2000-2009. I have also used a 5 year centered moving average. The raw data is in dark, the adjusted data in light. For Reykjavik prior to 1970 the peaks in the data have been clearly constrained, making the warming since 1980 appear far more significant. For the much shorter Svalbard data the total adjustments from GHCN and GISS reduce the warming trend by a full 1.7oC, bringing the warming trend into line with the largely unadjusted Reykjavik. The GHCN & GISS seem to be adjusted to a pre-conceived view of what the data should look like. What Nordli et. al have effectively done is to restore the trend present in the raw data. So Nordli et al, using data on the ground, has effectively reached a similar conclusion to Trausti Jonsson of the Iceland Met Office. The adjustments made thousands of miles away in the United States by homogenization algorithms are massive and unjustified. It just so happens that in this case it is in the opposite direction to cooling the past. I find it somewhat odd Øyvind Nordli, an expert on local conditions, should not challenge these adjustments but choose to give the opposite impression. What is even worse is that there might be a legitimate reason to adjust downwards the recent warming. In 2010, Anthony Watts looked at the citing of the weather station at Svalbard Airport. Photographs show it to right beside the runway. With frequent snow, steam de-icers will regularly pass, along with planes with hot exhausts. The case is there for a downward adjustment over the whole of the series, with an increasing trend to reflect the increasing aircraft movements. Tourism quintupled between 1991 and 2008. In addition, the University Centre in Svalbad founded in 1993 now has 500 students. Isfjord Radio. The station was established on 1 September 1934 and situated on Kapp Linne´ at the mouth of Isfjorden (Fig. 1). It was destroyed by actions of war in September 1941 but re-established at the same place in July 1946. From 30 June 1976 onwards, the station was no longer used for climatological purposes. But NASA GISS has data from 1912, twenty-two years prior to the station citing, as does Berkeley Earth. I calculated a relative anomaly to Reykjavik based on 1930-1939 averages, and added the Isfjord Radio figures to the graph. The portion of the raw data for Isfjord Radio, which seems to have been recorded before any thermometer was available, shows a full 5oC rise in the 5 year moving average temperature. The anomaly for 1917 was -7.8oC, compared with 0.6 oC in 1934 and 1.0 oC in 1938. For Svarlbard Airport lowest anomalies are -4.5 oC in 1976 and -4.7 oC in 1988. The peak year is 2.4 oC in 2006, followed by 1.5 oC in 2007. The total GHCNv3 and GISS adjustments are also of a different order. At the start of the Svarlbard series every month was adjusted up by 1.7. The Isfjord Radio 1917 data was adjusted up by 4.0 oC on average, and 1918 by 3.5 oC. February of 1916 & 1918 have been adjusted upwards by 5.4 oC. So the Spitzbergen warming the trough to peak warming of 1917 to 1934 may have been more rapid and greater than in magnitude that the similar warming from 1976 to 2006. But from the adjusted data one gets the opposite conclusion. During the Second World War, and also during five winters in the period 18981911, no observations were made in Svalbard, so the only possibility for filling data gaps is by interpolation. The latest any data recording could have been made was mid-1941, and the island was not reoccupied for peaceful purposes until 1946. The “raw” GHCN data is actually infill. If it followed the pattern of Reykjavik – likely the nearest recording station – temperatures would have peaked during the Second World War, not fallen. Real Climate should review their articles better. You cannot rebut an enlarging problem by referring to out-of-date and dogmatic sources. You cannot pretend that unjustified temperature adjustments in one direction are somehow made right by unjustified temperature adjustments in another direction. Spitzbergen is not only cold, it clearly experiences vast and rapid fluctuations in average temperatures. Any trend is tiny compared to these fluctuations.